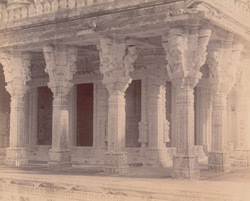 Photograph of the south side of the Chaumukh Temple, Satrunjaya, from the Archaeological Survey of India Collections taken by Henry Cousens in the 1880s-90s. Satrunjaya is an ancient Jain place of pilgrimage. These pilgrims believe that Adinatha, the first Jain Tirthankara visited the site several times and his disciple Pundarika obtained enlightenment here. On the two summits of the hill, 600 metres above the town of Palitana, there are many hundreds of multi-spired temples where pilgrims come to worship the different Jain saints. The sanctuaries are grouped in fortified enclosures or tuks, named after their founders. The Chaumukh Temple, located on the northern edge of the hill, is one of the most important temples of Satrunjaya. It was rebuilt in 1618. The square sanctuary enshrines a four faced image of Adinath of white marble in a shrine open on four sides. This is a view of the colonnade on the south of the temple. The columns are highly decorated, with bracket capitals in the form of dancers and musicians.